Given that you encounter the aforesaid case, probably you would also type this question on Q&A site. Guess some warm-hearted net friends would recommend you to have a shot on the world-eminent software - MKV2VOB, as it's an adorable freeware capable to convert MKV to VOB for burning to DVD or playback on Sony PS3. Honestly speaking, for newbies, it's hard to tell it's a good choice or not. So, for your benefit, it's reasonable to have a comprehensive acquaintance with MKV2VOB. MacX Video Converter Pro - No.1 fast speed to convert MKV to VOB, AVI MP4 MOV FLV, and other 180+ video and 14+ audio formats. Also convert and import MKV to iMovie/iTunes/QuickTime, iPhone! 1. Competent to convert MKV to VOB, Blu-ray, AVCHD, MTS and M2TS. 2. The remux of MKV files to VOB files without transcoding or recompression involved so that the speed is definitely untrafast and the output quality is good. 3. Neat and user-friendly interface. 1. Lack of a comprehensive "Help" file. 2. The interface fails to be resized or set to stay "always on top". 3. Convert specific MKV files with x264 video and AC3 audio, that's to say, not all MKV files you are allowed to import to the MKV2VOB for converting. 4. Designed for the Microsoft Windows (Windows 8 compatible) only, Mac users are not the lucky dogs. Consequently, if you are a windows user and feel "OK" about MKV2VOB's merits and dismerits, maybe MKV2VOB is just your cup of tea. For Mac users, instead of feeling sorry about this, you can turn to a superb MKV2VOB for Mac alternative. Fortunately, the highly sought-after MacX Video Converter Pro is just standing-by. The award-winning MacX Video Converter Pro is a reliable yet self-explanatory MKV video converter to let you decode and encode MKV video files to VOB format at 250-320FPS, 5X faster speed than MKV2VOB as well as Keepvid, clipconverter, etc, thanks to its advanced hyper-threading tech, multi-core CUP (up to 8) use and Intel QSV hardware acceleration tech. On top of this, with 320+ video and 50+ audio codecs supported, it can convert almost any video format to 180+ video and 14+ audio formats, including MKV to MP4, AVCHD to MOV, AVI to MP4, FLV to AVI, MP4 to MP3, 4K UHD to 1080P FHD, etc. with virtually no quality change (High Quality Engine & parameters adjustment). After free downloading this MKV converter, import MKV source video by clicking "Add File" button. Batch conversion is also supported. Choose the output format as you like. To convert MKV videos to DVD VOB format on Mac, you can simply hit DVD Profile > NTSC DVD Format or PAL DVD Format > Done to do the conversion. Click the "Browse" button to select a folder where you want to store your converted files. Hit the "RUN" button to start MKV conversion to VOB on macOS. Feel thirsty to free convert MKV to AVI format desperately? Stay on the page, you will get the best MKV to AVI converter freeware that helps you easily transfer MKV video to AVI format for free on Mac computer at blazing speed. Looking for a way to convert MKV to 3GP on Mac? This tutorial shares you how to compress and convert MKV to 3GP with smaller file size. With a couple clicks, you can enjoy MKV videos on HTC, Samsung, Nokia, etc on the go. Yearn for freely converting MKV to MPEG on Mac? This tutorial will share with you a gratis yet premium MKV to MPEG Mac converter for you to free convert MKV to MPEG with better quality. 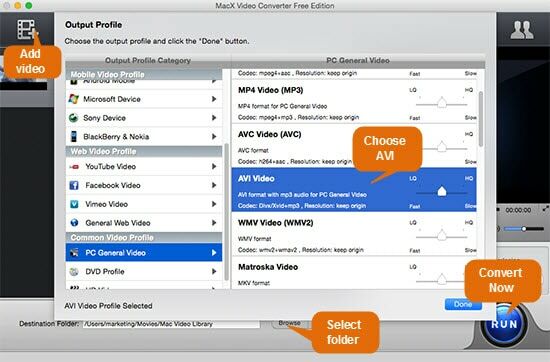 MacX Video Converter Pro is the best MKV video converter I've ever used. It can convert any MKV video to MP4 MOV M4V, etc. no matter the H264, MPEG-4 or HEVC/H265 codec. Plus, its fast speed is quite impressive. Only 27.58 seconds and my MKV files are successfully converted to QuickTime mov format in batch.